should happen to hold strong allegiances to either category, proceed with extreme caution before reading further, or watching the video above. If you already caught the clip and are preparing a strongly worded email to our newsroom, please remember we’re just the messengers. We’d never commit such an automotive travesty on a Mazda RX-8 – LS swaps make much more sense. The video of this aptly-named “RX-Hate” comes from a YouTube channel called Bodge Rides Garage, and it’s worth noting that the clip is actually a couple years old. It recently made a fresh showing in the social media realm which brought it to our attention, and the headline pretty much says it all. 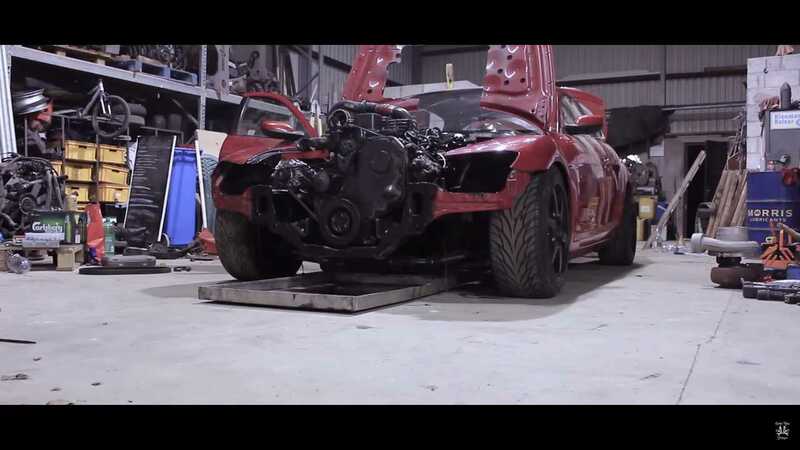 That is, save for one critical factor – this diesel-swapped Mazda RX-8 didn’t borrow a Cummins engine from a mere pickup truck. It’s a 6BT turbocharged mill pulled from a freaking big rig. As far as Mazda swaps go, this is pretty much as anti-rotary as you can get, and if you’re wondering how such a big engine fits under the hood of a small RX-8, well, it doesn’t. The video chronicles the build, and as you can see there’s just a bit of fabrication required to bring these two very different worlds together. Actually, the entire front of the car gets hacked up, not to mention the transmission tunnel and the interior. And is that the radiator we see in the back of the car? It’s not an optimal location for airflow, but with the engine basically assuming duties as the front bumper, beggars can't be choosers. Still, it all manages to work. The video concludes with a bit of backyard drifting footage, and of course there’s the requisite burnout to show that diesel torque trumps rotary horsepower. We don’t have other details on the build or even if it’s still working; the YouTube channel has just a few videos and it hasn’t been updated in over a year. It’s definitely one of the more sketchy projects we’ve seen, but kudos to these guys for even trying it. Here's hoping rabid individuals from the diesel or rotary crowd didn't take matters into their own hands.